"The only public housing this city provides is county jails," Bilal Ali of the Coalition Against Homelessness said at a rally on the steps of San Francisco's city hall last Tuesday. Ali was referring to the construction of new prisons, which will continue to receive millions in funding, while the city's affordable housing crisis continues to spiral out of control. The rally was held to bring attention to the lack of funds provided to social programs under Mayor Ed Lee's proposed two-year, $8.9 billion budget plan, introduced formally to the board of supervisors on Monday of this week. "The budget has to reflect the current social economic conditions," Ali said. "It doesn't make sense to hire more cops when crime is at a low and housing, healthcare, and seniors aren't being taken care of." People in the crowd yelled, "Housing, not handcuffs!" and "Wages not cages!" emphasizing the fact that more funds need to be allocated to programs that support families, with affordable housing at the top of that list. "The city of St. Francis should take care of the homeless, not cite them," said Supervisor David Campos. Campos represents District 9, where the city's Mission district is located and where some of the city's most aggressive gentrification is taking place. "It's our city, and city budgets need to reflect that fact," he added. Even with an over $22 million surplus in 2014, little from Mayor Lee's proposed budget is expected to trickle down to the city's neediest when it comes to housing. Specifically in areas like the Mission, where the much-debated plan to build a ten-story, 341-unit luxury condo is expected to be the final nail in a coffin for the remaining Latino and lower-income residents. According to a study done by CityLab, San Francisco County will be the whitest county in the region by 2040, while neighboring counties continue to see a rise in diversity. The recent tech boom has introduced a new majority into neighborhoods that were once historically Latino. And with rent rising 14.8 percent annually in San Francisco, it is becoming increasingly difficult for everyone to hold onto their small piece of home. According to the developer Maximus Inc., most units at the luxury condo on 16th & Mission, commonly referred to by activists as the "Monster in the Mission," will cost between $3,500 and $5,000 a month. 41 of the 341-unit building will be reserved for low-income families, with below-market-rate rental prices ranging from $510 a month for studios to $1,335 for 3-bedroom apartments. Maximus has also offered to build 49 affordable housing units away from the Mission district to add to the community benefits. "They're charging $3,000 to $5,000 dollars a month in a neighborhood that's impoverished," said Mission resident James Williams. "They're also running a lot of family businesses out." Food vendors and other small businesses that have shaped the neighborhood are also being pushed out along with low-income residents. Vendors provide some of the most affordable groceries in San Francisco. At La Mission Market on 17th & Mission, owner Adil spoke to me about the changes in the neighborhood. Adil is one block away from the possible site of the new luxury condo, and he fears that more luxury living will eliminate the customer base he depends on, which are families. "Gentrification of the Mission is more a threat to me than anything else," Adil told me. "The five years I've been here, I've seen my customer base change from 90 percent Hispanic and 10 percent other to now 50 percent Hispanic. And the other 50 percent is mostly white young yuppies that really don't spend any money. They don't eat at home." Latinos have now become a minority in the Mission and continue to fear economic expulsion due to the increasing cost of living that trickles into rent, transportation and food. 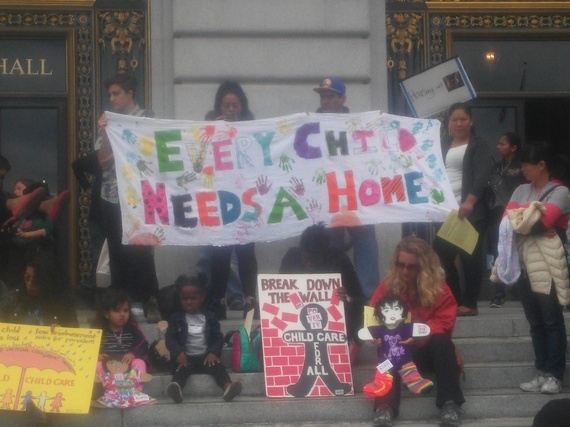 What is happening in the Mission are symptoms of a larger epidemic happening all around the Bay Area, where enormous waiting lists for scant public housing has left thousands of families on the streets. In Oakland, the developers UrbanCore are preparing to build a 298-unit luxury condominium near Oakland's Lake Merritt area. The development came under attack for not planning to provide a single affordable living unit, resulting in city council meeting disruptions by local activists trying to delay the vote on the sale of the public land. Mayor Ed Lee's housing bond measure will be on November's ballot and will ask San Franciscans to approve $250 million to build or remodel 30,000 affordable and market-rate units by 2020. Supervisor Avalos would like to push that number to $500 million. This afternoon, the board of supervisors will consider placing a 45-day moratorium on the construction of all luxury condos in the Mission district. This would temporarily halt Maximus' development and allow community members more time to get involved and advocate for affordable living in the Mission. By fighting for increased housing options for low-income families, activists hope that one day, leaving the Bay Area or homelessness aren't the only options for families struggling to find affordable housing in the city.